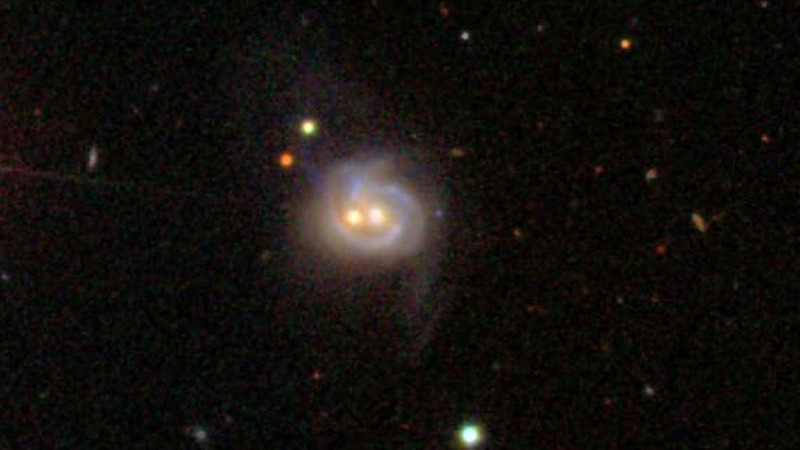 As two galaxies enter the final stages of merging, scientists have theorized that the galaxies' supermassive black holes will form a "binary," or two black holes in such close orbit they are gravitationally bound to one another. In a new study, astronomers at the University of Maryland present direct evidence of a pulsing quasar, which may substantiate the existence of black hole binaries. "We believe we have observed two supermassive black holes in closer proximity than ever before," said Suvi Gezari, assistant professor of astronomy at the University of Maryland and a co-author of the study. "This pair of black holes may be so close together that they are emitting gravitational waves, which were predicted by Einstein's theory of general relativity. This study was published online April 14, 2015, in the Astrophysical Journal Letters. The discovery could shed light on how often black holes get close enough to form a gravitationally bound binary and eventually merge together.